The country is virtually in an election mood. The representatives of the main political forces talk about the presidential elections and their candidates. 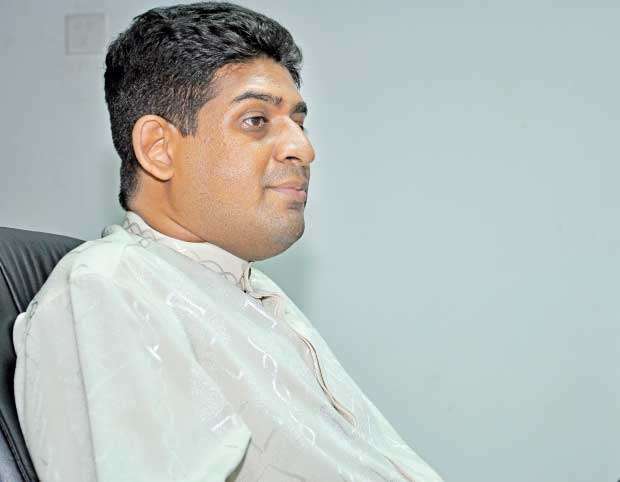 Against this backdrop, State Minister of Foreign Affairs Vasantha Senanayake in an interview with Daily Mirror, shares his views on the candidate to be fielded by the United National Party (UNP). He is also critical of the foreign policy of the government. Q Recently, at a political event in Polonnaruwa, you made a point that the UNP should field a new candidate at the next presidential election to be conducted at the end of next year. What did you really mean? My idea is that the most popular UNP candidate should be fielded. Only the UNP organizations can ascertain the most suitable candidate. These organizations could determine who the most popular candidate is for the presidential election and he should be the one to contest the polls. Q What is the reason for you to come out with such remarks at this stage in particular? I did it because I was asked by my constituents during the meetings I had with them in villages, who the candidate would be. I gave my views on the candidate. I did not mention any particular candidate. I said it should be the most popular candidate at that time. That candidate could even be the Prime Minister if he becomes the most popular candidate by that time. Yet, this should be ascertained by discussing with the general party membership. Q What is your assessment on the political situation in the country and the strength of your party? I think the party has suffered a serious setback after the defeat at the local government elections. It is not a setback that we cannot recover from. We can certainly overcome the setback if we act intelligently. Q You talked about the new candidate. What do you think about the UNP’s policies? I think there is a shift towards rural development. That is to take the development process to village level compared to the previous years. I think that is an improvement. Q How do you see the liberal economic policies which the UNP advocates? Liberal economic policies are a very good move. There has to be a structure of socialism to protect people as well in that liberal structure. Q Is it missing in the present setup? I think there has to be a mixture of capitalism with socialist principles to protect the people. Q What is your position on the present policies of the UNP on the ethnic issue? I think the government -- not the party -- has to be a little more proactive with regard to protecting minority rights and solving their issues. Particularly after the war was over, in the areas affected by the war, there is feeling that the government has forgotten them to some extent. I think the statement by MP Wijayakala Maheswaran reflects that a bit, although I do not agree with the remarks. The government should do a little more to protect the rights of those people. Then, they feel that they are secured. Q What is your position on the character of the Constitution, especially in reference to the foremost place accorded to Buddhism? In my view, the country should always be secular. However, it has been giving the foremost place to Buddhism and protecting it. Now, it has been incorporated into the Constitution. There is no way that we should try to reverse it. If we do so, we would be seen as anti-Buddhist and unpatriotic. So, we cannot reverse the position of Buddhism in the Constitution now. But in a secular state, Buddhism should be protected, nurtured and given foremost place by the government. Q You are among the very first MPs to defect from the previous rule to support President Maithripala Sirisena as the common candidate. Today, the political forces that you were instrumental in defeating have raised their heads again. They won the local government elections. How do you assess that phenomenon? They won not because of any farsightedness or due to anything significant they did. They won because of our own mistakes. We did not perform well as we should have, during the past few years. In the economic areas, international relations, agriculture and every other sector, we did not do well. Still, we are sending mixed messages via the President and the Prime Minister. Q Your great grandfather pioneered the agriculture development in the country through the colonization schemes. What is your policy on the agriculture sector development? First of all, we must have a policy on water. We have to adopt more effective ways to conserve water. Water is one of the most wasted resources in our country. Also, we have to have a policy in place on pesticides and chemicals. There should be a consistent policy which does not change after every little protest. We have to adopt a policy to determine whether we are using organic fertilizer or going to ban certain chemical substances. Then, we can go back to the older models of irrigation built by the ancient kings of Sri Lanka. We have abandoned that. We are using the tanks built by them, but we have forgotten the cascade system of water filtering that existed in ancient Sri Lanka. That system kept out the silt. One of the biggest problems is the silting of tanks. Q You are the State Minister of Foreign Affairs and you have mentioned the government did not do well in international relations. How did it happen? I think we have inconsistent policies. They change very frequently. For foreign policy, you must adopt long term policies, preferably national policies. In this regard, we can take a leaf from India’s book. Whichever the government that keep changing in India, they carry out one foreign policy. Here, it is not, when the governments keep changing. Even inside this government, it tends to fluctuate when the ministers change. We have to have a central policy. We should not be inclined too much towards any power bloc. But, we must get the support of everyone. Q There is perception in the country that the present government is bent on the West when it comes to the foreign policy. Do you agree? Yes, it does look that way. Q How do you specify your answer? Of course, the West must be our friend. We must have friendly relationship with the West. Likewise, links with traditional allies such as China, Russia and India are also important. It is also important to have links with up and coming associations such as ASEAN and the countries like Australia. Also, we have to look at new markets such as Africa and Latin America. We have to be more global in our approach without antagonizing anyone. Q Actually, the previous government did some work in this regard. What are your views on it? The previous government was pro-China. May be, they were a bit pro-Russia as well. Yet, they antagonized the West. That was also not a good policy. It should have been more balanced and neutral. Q What is your position on the government’s decision to co-sponsor the UNHRC resolution on Sri Lanka in 2015? I personally think it was not a good thing to do. If you read some of the matters stipulated like the provision for foreign Judges, these are not the things that should be included in the resolution at all. There was no compulsion for us to co-sponsor. But, we voluntarily went and did it. If we were going to co-sponsor, we should have read the document better and negotiated for reasonable terms. Some of the things we have signed up are politically suicidal. We need constitutional changes to do some of the things. How can you change the constitution without holding a majority in Parliament? Q Have you raised your voice in the government in this regard? Sometimes I only hear my voice and should shut up. There is a limit to what extent one person could raise the voice. Q How is your relationship with your Cabinet Minister of Foreign Affairs? He does not consult me on anything. He does not invite me for any meeting. He has refused to gazette my functions as the State Minister. It has been given to all the other State Ministers except for me. I bear no grudge. I hope he, as a learned man, would be more sensible. Q There is a perception that this government has antagonized China at the beginning by suspending the port city project. How do you view the government’s relations with China? It has got better now. Relationship with China is getting better. We should be good friends with China just as much as we should be with the United States. We should not lean more towards one side. Also, we should have very good relationship with our neighbour, India. It is paramount. Q Ahead of the No-confidence motion, you took a certain stand. During the voting, you took another stand. What is the reason for that change of mind? That is the stand I had always taken. That was the need for reforms. That was because he promised to bring in changes. Q What do you think of the progress made so far? The other MPs are not talking. I think they are happy with the changes. I am not all that happy with the changes. I think more changes should have been made. Since my voice is not recognised, I have to respect the view of the majority. Q What are the changes that you had expected? I think all the office bearers in the party should be chosen through a poll. Everyone. That is what democracy is. Q Since this is the party which was founded by your great grandfather, do you think you have a right to stake a claim for it? I do not say that I have any right just because my great grandfather founded it. Of course, I have a sentimental attachment towards the party. Q Has the UNP made a departure from the founding principles of it? Yes, it has departed radically, and it continues to do so. To start off, I think it is democratic principles. The agriculture policy has changed. The view on foreign relations is not the same. There were significant changes. Q You were with the previous government and defected later. Would you do the same to the incumbent government in case your voice is not recognized? I will try my best to stay in the party, demand and shout for changes. Defecting can only happen if the situation becomes absolutely hopeless. I do not think the situation has degenerated to that as yet. Q You represent Polonnaruwa. That is the electorate that is being represented by President Sirisena. How do you cooperate with him in development activities? It is difficult. He is the President and not in Polonnaruwa most of the time. I have to deal with his officials and representatives. On many occasions, they are not very cooperative. Q The UNP came third in Polonnaruwa at the local government elections. What was the reason? President Sirisena was the reason. UNPers too voted for him. He couldn’t get votes from SLFP. Q How could he get votes from the UNPers being the SLFP leader? All the development works are implemented by him in Polonnaruwa. The UNP doesn’t have a Cabinet Minister in Polonnaruwa to counter even half of what he has done.